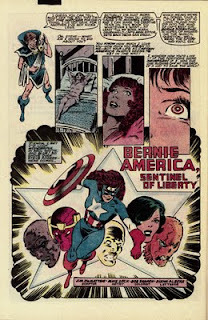 Hi again, today’s post focuses on Bernadette “Bernie” Rosenthal, Captain America’s longtime girlfriend. The Assistant Editor for this issue was Mike Carlin. For those unfamiliar with his work, Carlin has worked as a writer and editor in comics for most of the past four decades. In the 1990s, he worked for DC and served as editor on their Superman books. During his time at DC, Carlin oversaw the famous "The Death Of Superman" saga. But let’s get back to Bernie! Bernie Rosenthal was created by Roger Stern & John Byrne and first appeared in Captain America #248 back in 1980. She was a glass blowing artist, described in her official Marvel bio as "one of the most talented glass blowers in the New York metroplex". Bernie was more than an intellectual match for Steve Rogers and often teased him about his interest in 40s films & music. 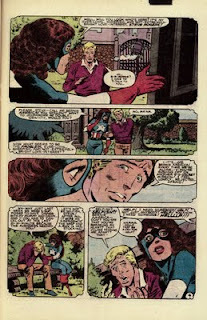 Eventually, she discovered that Steve was secretly Cap, and the two were engaged to be married for a while. Their relationship ended when Bernie left New York to attend law school. Nothing against Diamondback and the Carter sisters, but for my money, Bernie was the best love interest Cap ever had. The “Mary Jane” to his “Spider-Man”, if you will. I was sorry to see her get written out of the book. I don’t follow current comics, but I hear Bernie recently returned for a spell as Bucky’s lawyer and still enjoys a friendship with Cap. As for this issue, let’s start with the cover at the top of this post. 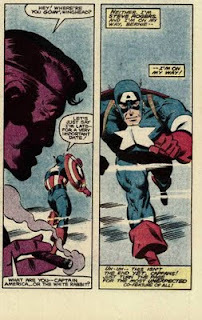 In the corner box, Cap has his back turned. 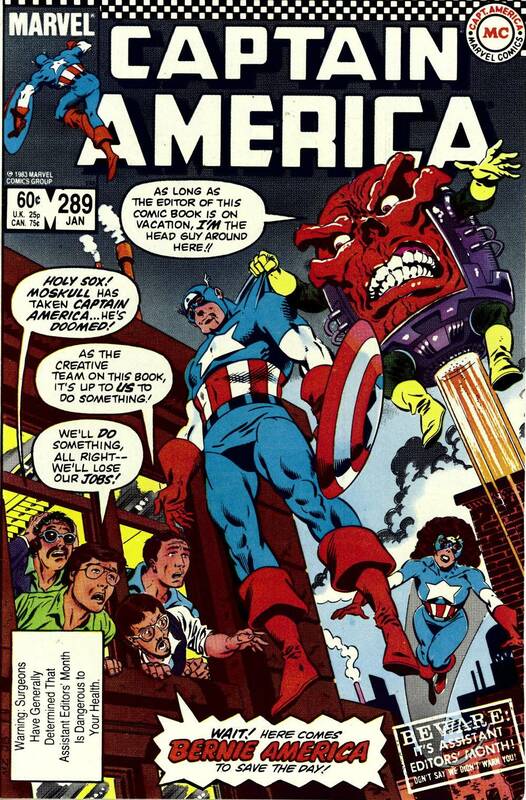 He's being menaced by Mo-Skull (an amalgam of Red Skull and MODOK), while Bernie America rushes in to save him! Which leads to the back-up feature. 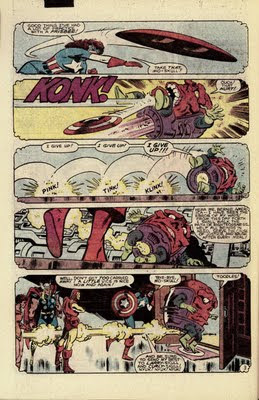 It's introduced by Mike Carlin, dressed as the Watcher! We see Bernie at her parents' house, daydreaming about Steve’s life as Captain America, wondering how Steve would feel if their roles were reversed. She falls asleep and we get to see Bernie's dream! 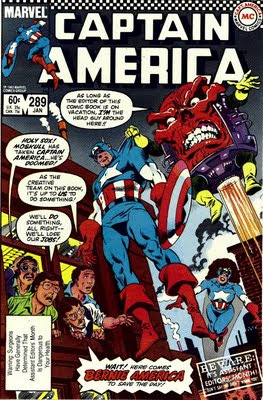 “Bernie America” attends a meeting with her fellow Avengers at their mansion, when suddenly they're attacked by Mo-Skull! Yep, Bernie's subconscious has combined Cap's foes MODOK and the Red Skull into an amalgam villain. Bernie easily defeats Mo-Skull (I love the way he simply walks away! ), and Steve Rogers shows up. He wants to have a “State of the Relationship” talk with Bernie. In the middle of their conversation, Bernie hears a call for help and runs off to save the day. Steve weeps over playing second fiddle to Bernie's crime fighting career. That's when Bernie's sister Nancy wakes her up and announces that she has a visitor! It's Steve! They embrace and Bernie is thankful that her "Bernie America" adventure was just a dream. 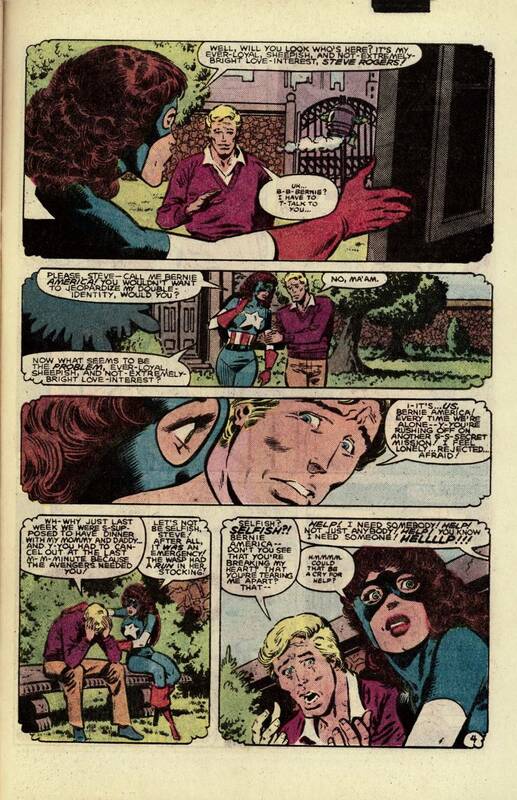 I'd say Bernie is also telling the readers, not just Steve, that being a superhero isn't easy, and being in a relationship with one is no picnic either. "I still have a ridiculous fondness for that "Bernie America" story." And so do I, 28 years later! I've had many dreams where something is just not quite right, people or places sometimes get combined (like Mo-Skull). A big "thank you" goes out to J.M. 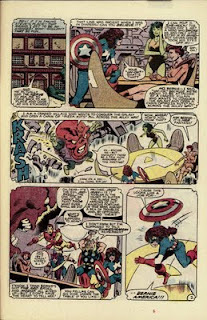 DeMatteis for answering my "fanboy" questions about this issue and I also want to thank him, Mike Zeck, John Beatty and Mike Carlin for giving us such a fun & memorable little story. What does Rom do when he's not fighting the Dire Wraiths? Check back here in a few days to find out! very nice--and a very worthy subject for a blog! 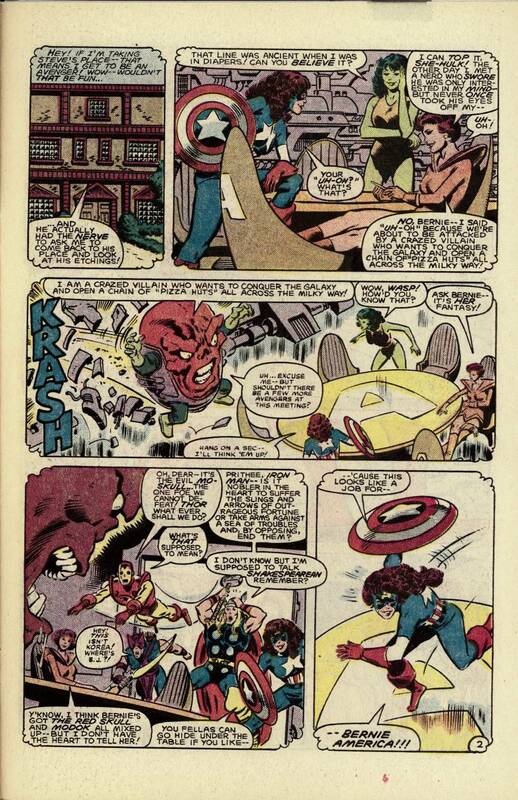 I remember this story, Mo-Skull and Bernie R. (even though I see why Gruenwald had to write her out of the story he wanted to tell) very fondly as well!